Which of the two forms of the Roman Rite, as Pope Benedict XVI called them, best encourages active participation, is most emotionally satisfying, and unequivocally equips the worshiper with the graces necessary to confront the modern world? Dr. Peter Kwasniewski’s answer may surprise you. 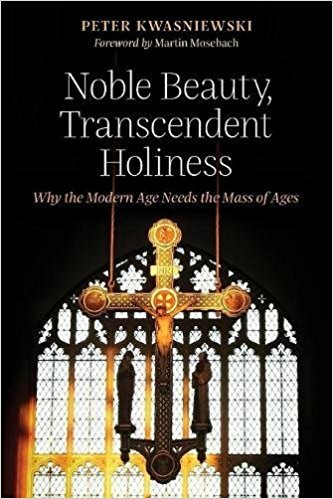 In his book Noble Beauty, Transcendent Holiness: that the Mass of the ages is the Mass, the Wyoming Catholic College philosophy professor and choir director contends, after much thought and prayer at and about various iterations of the Mass over many years, that the extraordinary form of the Roman Rite (the traditional Latin Mass) is, not just a personal preference for him, but indeed an objectively superior form in itself to the ordinary form (Novus Ordo Mass). Kwasniewski finds the extraordinary form of the Mass superior particularly in light of the fact that the ordinary form as the vast majority of Catholics know it looks and sounds almost nothing like what it was intended to be. There are so many habitual deviations from the rubrics that there is not just an ordinary form, but ordinary forms of the Roman Rite, depending on the parish. This encourages, not active participation, but hyperactive participation. We live in a very “upbeat” and “efficient” time that frowns upon contemplation and deep thought. Yet only through silent reflection will we ever fully become what we were meant to be. This does not mean being passive or unproductive; it means being intelligently (and actively) receptive to what God wants to do with us. This is in distinction to being mindlessly busy about many things (through constant talking, singing of liturgical-pop hymns and taking over roles we have no business filling). So the extraordinary form may have the edge with contemplation, but what about emotional fulfillment? Won’t that be hampered by the restraint the traditional Latin Mass places on our creativity? At first glance the ordinary form of the Mass may appear more emotionally satisfying, but a deeper analysis renders a different verdict from Kwasniewski. The Novus Ordo, he believes, has a superficial appeal that stimulates but does not satisfy. This is due to the circular nature of modern worship, which leaves us where we started: with ourselves. Our emotions are in fact not simply meant to be expressed in any way and at any time, but in proper measures at the proper times, and always under the guidance of faith and reason. The greater discipline found in the extraordinary form’s timeless objectivity is far more conducive to a healthy emotional life, because it provides us with a standard by which we are to humbly conform ourselves, rather than leaving us with the burden of glorifying our own whims. So the extraordinary form may have the edge with emotional satisfaction and balance, but what about being able to engage the modern world? Won’t that be prevented altogether by the extraordinary form’s mystical focus on God to the detriment of the immediate community? Kwasniewski believes that in order to remedy this world’s ills, we first need to get back to the Creator of this world and thoroughly immerse ourselves in His vision for life. Some of this immersion may seem foreign to us, but that is often an indication of its being salutary. The Latin language, Gregorian chant, ad orientem positioning and other aspects of the traditional liturgy tell us clearly that worship is about being drawn out of our own conceptions and into God’s holiness, which is, deep down, what we really desire. Only when we satisfy that most fundamental need can we really know how to fix things outside of us. I am afraid to say that it is not clear at all that most Catholics attending most vernacular Novus Ordo liturgies are ever confronted unequivocally and irresistibly with the reality of God and the demand for adoration. Or, to put it differently, the old liturgy forms these attitudes in the soul, whereas the new liturgy presupposes them. The author believes that if someone does not have the right take on God and what He demands of us, the ordinary form(s) will do very little to give those truths to that person. In fact, the revised liturgies will encourage—by omission and distortion—heterodox ideas, which is not something needed to confront the modern world. Kwasniewski’s book, on the other hand, confronts contemporary crises very well, not with ad hoc compromises, but traditional solutions. It is for any Catholic looking for a serious discussion of the central act of worship, but especially for conservatives who are comfortable with their Novus Ordo and see little or no reason to attend a traditional Latin Mass. The author cites not only John Paul II, but Benedict XVI, Cardinal Sarah, Cardinal Burke and other eminent Catholics to back up his thesis. 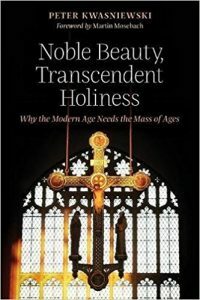 Insights from these Church leaders, along with the chapter comparing the Rosary with the traditional Latin Mass, will make readers more likely to realize they might agree with the thought-provoking (and prayer-provoking) message of Noble Beauty, Transcendent Holiness: that the Mass of the ages is the Mass needed by the modern age.